The Casio DG-20 is a midi guitar from around 1987. Think of it as a Casio keyboard+drum machine … but a guitar. I can even switch it to monophonic mode! I run this through a Turbo Rat distortion pedal which has been modified and cut down to fit in a small box that is velcroed to the guitar. Midi in the form of note on/off events from the strings is piped into the computer and used to generate audio and visuals. Many may laugh at a “plastic guitar” but it has no latency between its built in synth and midi out as opposed to half-assed, strap-on electric guitar midi systems which average around 10-20 ms. I love this thing … I feel limited when playing my electric guitar now. 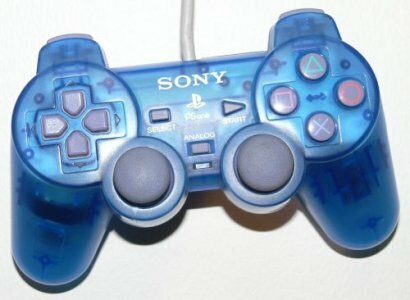 A simple, durable interface for musical control, used through a ps->usb converter. Velocipede is controlled with this. This is my old trumpet from school band. 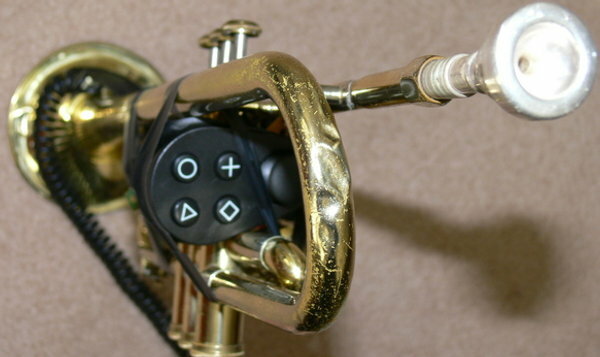 I hacked a Playstation controller and mounted it on the trumpet so that I can trigger events in the audio processing. A simple microphone is taped to the bell.